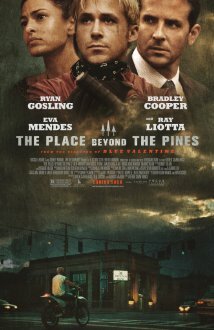 The Place Beyond the Pines (2012), R, 140 minutes - Back in 2010, Derek Cianfrance, who had previously directed television documentaries broke through with the critically acclaimed film Blue Valentine. Now he is back with his latest project: The Place Beyond the Pines, which just so happens to be generating its own fair share of acclaim. I first saw the trailer for Pines a couple of months ago and was instantly interested. I was curious to see what came next from Cianfrance, especially considering the cast he was working with: Ryan Gosling, Bradley Cooper, Eva Mendes, Ray Liotta, Rose Byrne, Bruce Greenwood. All have been in films that I've really enjoyed. As I learned more about the film, I found out that it is set in Schenectady, New York. A good friend of mine grew up in Schenectady and I had the chance to visit there when I went to his wedding a few years back. That's a fairly small tie to a place I know, but it still added to my interest in this film. Pines begins with Handsome Luke (Ryan Gosling), a motorcycle stunt driver who works for a traveling fair. While in town for the fair, he crosses paths with Romina (Eva Mendes), an old fling from the year before. He learns that Romina had a son (Jason) since he last visited and that the boy is his. He quits the carnival circuit so that he can stay in town and do the responsible thing: try and provide for his family. Unfortunately, that's not exactly what Romina was looking for. She, Jason and her mother are now living with Romina's current boyfriend Kofi (Mahershala Ali). She seems to be okay with Luke being a presence in Jason's life, but isn't necessarily looking for him to take Kofi's place. Luke finds work at a local garage as a repairman, but needs more money to provide for Jason and Romina the way he wants to. At the suggestion of his boss, a sketchy sort named Robin (Ben Mendelsohn), he begins robbing banks to bring in the kind of money he's looking for. That dynamic sets up The Place Beyond the Pines and is the first of three distinct story arcs that are masterfully pieced together when it is all said and done. To avoid spoiling too much I'll just say this: while the three arcs each focus on a different character, they all have connections to one another. Some known to the characters, some unknown. Their actions and reactions to their discovery of these connections are what really drive the film. The Place Beyond the Pines is an excellently acted film that has three stand out performances. Oddly enough, not only one from each story arc, but from each of the characters that are focused on in the film. The first is Gosling. He channels a very similar character to the one he played in 2011's Drive, a hardened man with a short fuse and a soft spot in his heart. The second is from Bradley Cooper. His cop character Avery doesn't pop up until about a third of the way through the film, but plays a vital role in the overall story. Like Luke, Avery tries more than once to do the right thing only to succeed and fail on varying levels. The third may be the strongest performance of the film. Dane DeHaan plays the grown up Jason in the third arc, a loner of a teenager who has never been told the truth about his father. After meeting AJ (Emory Cohen), the new kid in town and son to Avery (now the District Attorney), he begins trying to learn about his real father which leads him to other revelations as well. I also shouldn't forget to mention Eva Mendes' turn as Romina, which is easily the best performance of hers that I can think of. The Place Beyond the Pines is just as hard hitting and emotional as Blue Valentine was, but this time around Cianfrance explores the dynamics of fatherhood, the relationships between sons and fathers, and how trying to do the right thing doesn't always end up the way we intend. Here in my area it is only playing at the local art house theater. I don't know if it will get a more widespread release at any point, but I would highly recommend it with one caveat: if you're not in the mood for a very suspenseful, emotional flick then steer clear. The Place Beyond the Pines is an excellent film, and while the ending is more uplifting than that of Blue Valentine, it isn't a cheerful film by a long shot. Derek Cianfrance proves again that he has a knack for making films portraying the events of real life and real people, not the glossy Hollywood versions that we so frequently see. - I mentioned that the film being set in Schenectady, NY was part of what intrigued me. Imagine my surprise that I actually recognized one of the locations in the movie (despite my limited time visiting there)! The church towards the begging of the film (St. John's) was the church in which my friend was married. - I loved the parallel themes between Luke and Avery. I also really liked how the film ended on about as good a note as it could have. Both sons, connected without even knowing it for so long, were able to find their relationships with their fathers. On differing levels, sure, but they both ended up achieving some level of piece after all that had happened. - I also liked the grey area between straight laced and corrupt that Avery walked. He lied about the sequence of events that led to Luke's death so as to not get himself in trouble. After being reassigned he decides to expose the corruption within the police department. When that's not met with open arms, he blackmail's the DA who originally helped him out. And years later he sweeps AJ's and Jason's arrest under the rug. - The trailer focuses on Ryan Gosling's Luke so much, I have to admit, I was quite surprised when his confrontation with Bradley Cooper's Avery turned out the way it did. The two biggest names in the film really only have one third of the movie each to shine, which they do quite well. - Ben Mendelsohn and Ray Liotta were both quite good in this film as well. They were also both in Killing Them Softly towards the end of last year, in similar roles actually. - Not really spoilery, but worth mentioning: this was the first film that I saw at the Grandin Theatre since they made the conversion to digital projection last week. The conversion means a slight increase in admission prices, bringing them closer to the other theaters in the area, but they are still my first choice of a place to check out a movie here in the 'Noke!